In the first post of our series, we map out the steps to choosing and implementing a new CRM system. If there is one thing that has been proven time and again through our years of consulting on CRM software projects with advisory practices, it is that it is most certainly a journey. From the planning and preparation it takes to get up and running to the effort it requires to maintain progress and reach successively greater levels of usage and integration, there is a road to be navigated and there are users who need to be guided. Our journey begins in the land of No CRM. As with any journey, there are many stops along the way. Deciding you want to go to CRM Land is just the beginning and it isn’t just a one-week trip. Done right, it is in fact one that will last the lifetime of your business – evolving as your business grows and changes over time. 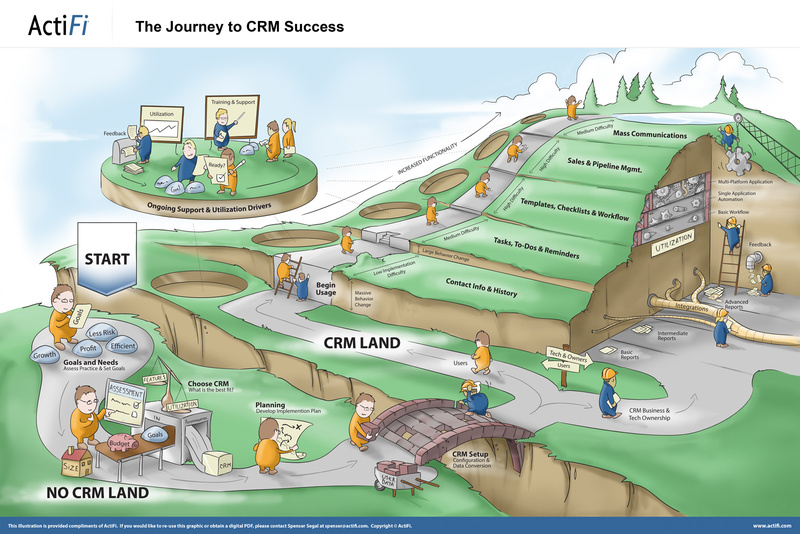 In this, the first in a series of postings, I will introduce the concept of the CRM journey, overviewing each step of the way as presented in the illustration above. In the coming weeks I will expand on each topic in greater depth. Let’s get on our way now to “No CRM Land” where our journey begins. The journey begins with the decision to adopt CRM, and it is a big one requiring a great deal of consideration. Business goals, growth projections, risk tolerance, human capital and many other factors play into the decision to move forward with CRM. Following a thorough business readiness evaluation it is time to begin the platform selection process. Platform specialization, budget, and functionality (i.e. contact and activity management, templates, workflows, and sales management) are a few of the considerations in this early part of the journey. With a seemingly endless supply of good CRM options available on the market, sorting through the potential solutions requires a rigorous process and well defined criteria. When commitment to getting on a CRM program has been made and a specific platform has been selected. The next phase of the journey is one of planning and preparation, which is the critical foundation for long-term success. This is a continuation of the pre-implementation phase of the journey. A clearly defined implementation plan is key to success with any CRM. Laying out every step of the way from No CRM Land to CRM Land with clear ownership for completion is an absolute necessity. This is the only way to keep the project on track and users apprised of what is coming and when. Now is also the time to review the data that will go into your new CRM. The cleaner and more complete the data is when it goes into the system, the better your results on the system will be. Of course there are a few cases where getting data into the CRM can actually enable data cleansing that is difficult in the system it is coming from – although that is an exception to the rule. With a plan in place and data prepped you’re ready to move to the new CRM. Setting up the new system, configuring it for your organization and converting the data are all part of this step. Depending on the complexity and the skill set and availability of your staff, this can be completed by your in-house team or, as is often the case, you can work with a third-party implementation partner. Guiding users along the journey to CRM is important throughout the process. Letting them know what is coming and when and providing training for each step of their onboarding will improve the speed of acceptance and overall system usage. This is one part of the journey that will repeat over and over as your system matures and expands over time. Even when the system remains static, refresher training can have a notable impact on the degree of overall CRM success you are able to achieve. Technical and nusiness owner stakeholders in the CRM journey have their own unique set of needs and responsibilities. Both are highly focused on business and functionality perspectives of CRM and must be closely aligned in terms of expectations. Both must also be solid proponents of the system: their commitment to the CRM system must be firm and they must set an example for users to follow. Lacking visible commitment from either of these parties can have a negative impact on the rest of the organization’s willingness to accept the new CRM system. Now that the system is in place, you are definitively into CRM Land. Contact information, tasks, to –dos, reminders, and history are the first functions you will take advantage of in any CRM system. When it comes to building and improving client relationships, these functions are core to everything else that can be facilitated through CRM. Taking the CRM journey farther will bring you into the realm of templates, checklists, and workflows. These are all ways in which you can begin to deepen the impact of CRM. Templates enable consistency, Checklists timeliness, and workflows automate simple and frequently repeated tasks. Taking the variation out of how and when things are done leads to greater organizational effectiveness. The ability to project future revenue is an important capability of a CRM. Through CRM you can effectively monitor your sales pipeline and associated activities. Better yet, CRM provides a means by which you can evaluate the pipeline and learn about timing and activity effectiveness. Dedication from leadership and consistent use by the sales team are two ingredients required for this functionality to provide true value to the organization. This journey into CRM Land will continue throughout the life of your business. As your business grows and changes from year to year, so might your needs in all of the areas listed above. An acquisition or divestiture, client growth, advisor turnover, product additions and many other events can significantly change the scope of your business. Understanding the CRM set-up that fits today might not fit several years from now is an important part of achieving CRM success. The willingness – and ability – to flex over time will ensure a platform that truly fits your needs well into the future.